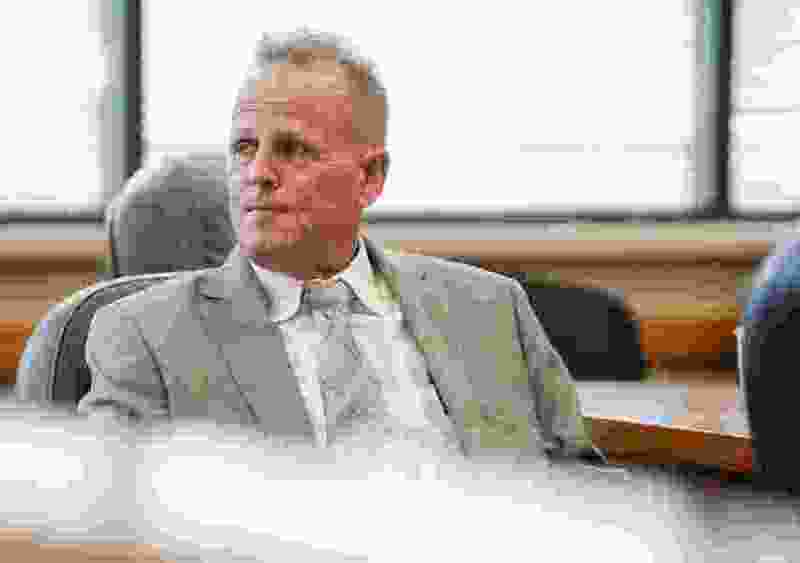 (Francisco Kjolseth | The Salt Lake Tribune) Mitchell Kyle Henderson who is on trial for allegedly trying to bribe and extort his ex-wife into dropping her domestic violence complaint appears in Fourth District Court in Provo, UT, before Judge Christine Johnson on Tuesday, Sept. 11. 2018. The trial Tuesday and Wednesday focuses on the bribery and extortion charges. A separate trial will be held in January for the domestic violence charges. A husband who last year found himself at the center of a debate over polygamy and the law has been acquitted of trying to extort his wife. An eight-person jury in state court in Provo found Mitchell Kyle Henderson not guilty of two counts of extortion or bribery. He faced up to 15 years in prison on each count. Henderson still faces a trial in January on charges he assaulted his legal wife, Nicole Henderson. The two-day trial this week in state court asked whether Kyle Henderson bribed or extorted his wife into dropping her domestic violence allegations by offering her custody of their children. The jury heard a recorded telephone call and read text messages in which the estranged couple discussed the domestic violence case and their children. Nicole Henderson is the daughter of state Sen. Kevin Van Tassell, R-Vernal. On the last night of the 2017 legislative session, Van Tassell showed his fellow senators photos of the bruises on his daughter. The Utah Senate was considering a bill that would have affirmed polygamy as a felony in Utah and increased the penalties for it in some cases. The Senate passed the bill that night, and Utah Gov. Gary Herbert later signed it. Kyle Henderson has pleaded not guilty in the domestic violence case. He and Nicole Henderson are in the midst of a divorce, but a decision on child custody awaits the outcome of both criminal trials. (Francisco Kjolseth | The Salt Lake Tribune) Mitchell Kyle Henderson, top, who is on trial for allegedly trying to bribe and extort his ex-wife into dropping her domestic violence complaint appears in Fourth District Court alongside his attorney Mark Shurtleff in Provo, UT, before Judge Christine Johnson on Tuesday, Sept. 11. 2018. The trial Tuesday and Wednesday focuses on the bribery and extortion charges. A separate trial will be held in January for the domestic violence charges. Kyle Henderson’s lawyer, former Utah Attorney General Mark Shurtleff, said he argued Nicole Henderson needs her husband to be convicted of a felony in order to gain full custody of their minor children. He argued that she was willing to deceive the jury about the contexts of the messages and a 75-minute phone call discussing the domestic violence case. “We really focused on what her motivation was to lie,” said Shurtleff, who argued the case while wearing a pink cast over his right lower leg. He said he broke a bone jumping over a wall at Rio Tinto Stadium while trying to watch fireworks from the field. The prosecution contended jurors didn’t need to worry about Nicole Henderson’s credibility — they could read the messages and hear the call themselves. Before trial, Shurtleff won a motion to bar testimony about polygamy. He worried that discussion of polygamy would prejudice jurors against his client. After Wednesday’s verdict, Shurtleff said, he interviewed jurors who told him they picked up on certain references and inferred that the Hendersons are polygamists. 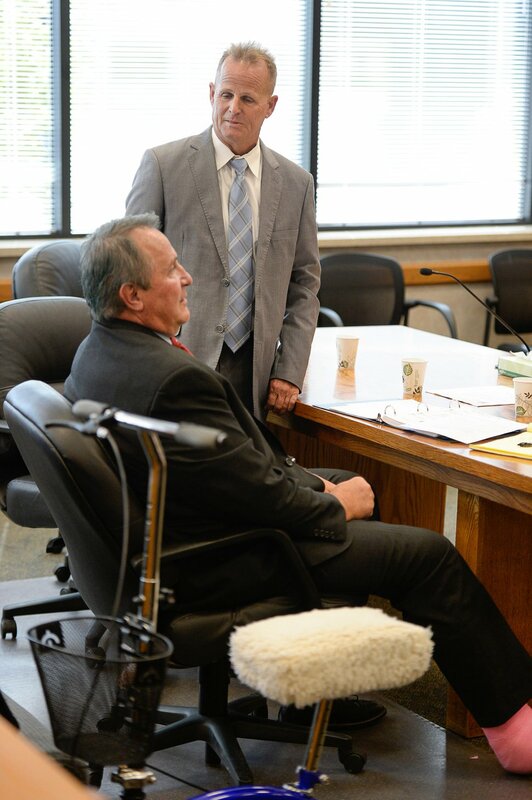 That has Shurtleff rethinking his strategy for the domestic violence trial. Instead of seeking to eliminate polygamy from the trial, he might oppose potential jurors who dislike polygamists.